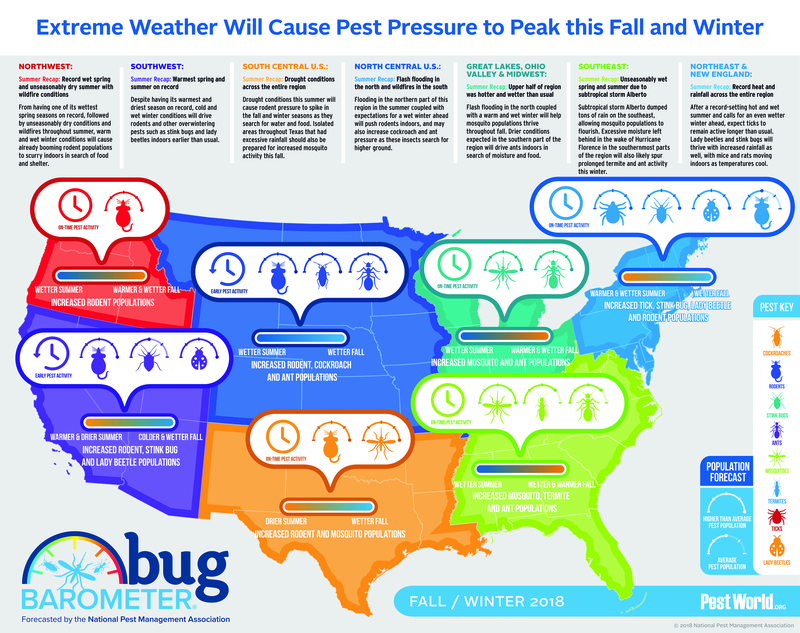 by Brianna Crandall — October 1, 2018 — The National Pest Management Association (NPMA) just released its semi-annual Bug Barometer, a seasonal forecast of the pest pressure and activity Americans can expect to see in their respective regions of the country based on weather patterns and long-term predictions, as well as pest biological behaviors. According to the group’s team of entomologists, erratic weather patterns and record-breaking rainfall are expected to cause an increase in pest pressure across the continental United States this fall and winter. This summer brought a whole host of extreme weather conditions that can affect pest pressure, including record rainfall in some parts of the country, and drought in others. With most of the country still damp from summer and fall, and winter forecasts predicting even more precipitation, expect an increase in activity from moisture-loving pests such as mosquitoes, termites, cockroaches, stink bugs and rodents. Rodent populations will become public enemy number one as they seek shelter indoors and are in search of steady sources of food and water. 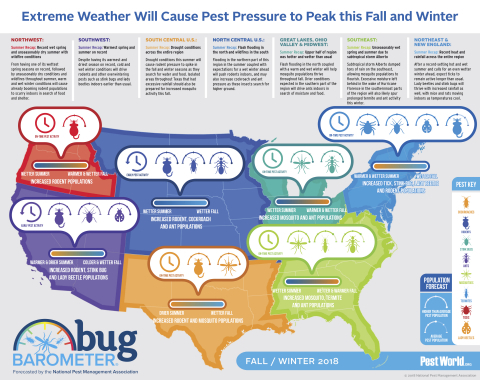 Based on this analysis, the National Pest Management Association’s Bug Barometer is forecasting a spike in major pest populations across the entire US this season, as highlighted below. Flash flooding in the north coupled with a warm and wet winter will help mosquito populations thrive throughout the fall. Drier conditions expected in the southern part of the region will drive ants indoors in search of moisture and food. For more information on NPMA’s Bug Barometer or to learn more about protecting against specific common pests, visit PestWorld.org.